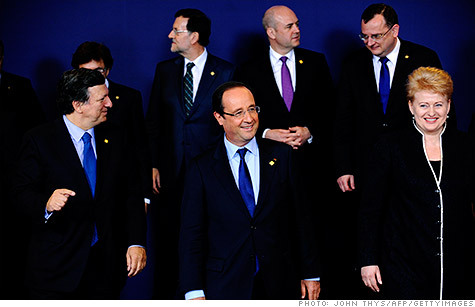 EU leaders pose for a family photo at a summit in Brussels, where eurozone officials agreed on steps to strengthen banks and stabilize markets. NEW YORK (CNNMoney) -- Euro area leaders agreed early Friday on a number of steps designed to stabilize eurozone credit markets and strengthen the region's banking system. After a late-night round of talks in Brussels, the leaders agreed to move toward more centralized banking regulations and use bailout funds more liberally to support eurozone governments in the bond market. The leaders hailed the agreement as a "breakthrough," but many of the details have yet to be finalized and implementing the plans could prove politically and legally difficult. "These steps are the obvious ones to take to try and restore some confidence in the market in the short term," said Gary Jenkins, analyst at Swordfish Research. "Alone they do not solve the underlying problems but they might buy a bit of time which is probably about the best they can do right now." Investors, who had been bracing for a more disappointing outcome, welcomed the agreement. Stocks in Europe and the United States gained more than 1%. Yields on Spanish 10-year bonds fell to 6.4%, down from highs above 7% last week. Italian bond yields also eased, with the 10-year falling to 5.8%. The euro jumped to nearly $1.27 Friday. "I know that many people were skeptical about the prospects for this summit," said Jose Barosso, president of the European Commission. "And I hope that they were pleasantly surprised when they heard the news this morning." Despite Friday's rally, investors may have a more critical view as they take a closer look at the agreement, said Nicholas Spiro, director of London-based consultancy Spiro Sovereign Strategy. "We've been down this road before, this is a well trodden path" he said. "There's a relief rally, then investors inspect the fine print and realize that, at the end of the day, Germany didn't blink." The moves announced Friday are aimed squarely at Spain, while Italy stands to benefit to a lesser degree. The leaders agreed to inject bailout funds directly into Spanish banks, rather than lending money to the Spanish government, which would drive up Madrid's debt load. They also decided to withdraw the preferred creditor status of the European Stability Mechanism, the bailout fund that will finance the recapitalization of Spanish banks. This had been a major concern for investors, who worried that private bondholders would be ranked second in any restructuring of Spanish government debt. Bond market bailout: The leaders said they will use bailout funds "in a flexible and efficient manner in order to stabilize markets" for euro area nations that are undertaking economic reforms. The move is designed to restore confidence in the bond market, where Spain and Italy have been struggling to maintain credibility. But analysts say the bailout funds may not have the resources necessary to fully backstop the market for the third and second-largest euro area economies. The ESM, along with the European Financial Stability Facility, have about €500 billion between them, said Chris Scicluna, Chris Scicluna, head of economic research at Daiwa Capital Markets, in a note to clients. In contrast, Italy and Spain have about €2 trillion in debt needs, he added. "It's not clear that the ESM could decisively turn the market," said Scicluna. "And turn the market it has to do if it is to be effective - just stabilizing yields at their current levels is not sufficient." Some analysts say using bailout funds to buy government debt, a move championed by Italian Prime Minister Mario Monti, is a concession by German Chancellor Angela Merkel. But others argue that Merkel did not waiver, since any government that accepts the support would still be required to meet existing fiscal requirements. "Merkel agreed to let common sense prevail by not asking Italy and Spain to potentially kill their economies through an overdose of austerity," said Holger Schmieding, chief economist at Berenberg Bank. Banking authority: The leaders said they will consider proposals to establish a single banking supervisor for the euro area, involving the European Central Bank, by the end of 2012. The move is a step towards the formation of a so-called banking union, but the leaders did not say anything specific on other key aspects, such as common deposit insurance and a mechanism to resolve failed banks. The goal is to break the "negative feed-back loop" between banks and governments. In Spain, for example, domestic banks have been the main buyers of Spanish government debt. That means a bailout of the government would drag down the banks, and vice versa. However, analysts say the creation of a centralized banking authority would mean a significant loss of sovereignty that many euro area nations may be unwilling to accept. Growth pact: The leaders also backed a €120 billion "growth pact" to stimulate growth and create jobs. The centerpiece of the pact is a €10 billion increase in the funds of the European Investment Bank, which EU policy makers say will boost its lending capacity by €60 billion. The leaders agreed to reallocate €60 billion in unused structural funds to subsidize small businesses and reduce youth unemployment. They also backed a €10 billion program to test "project bonds," which will be used to fund investments in energy, transportation and broadband across Europe. The pact builds largely on existing economic policies and seeks to make the most of what limited resources the EU has to boost growth. It is generally viewed by investors as insignificant, since the amount of money involved is relatively small, equal to about 1% of eurozone economic output.